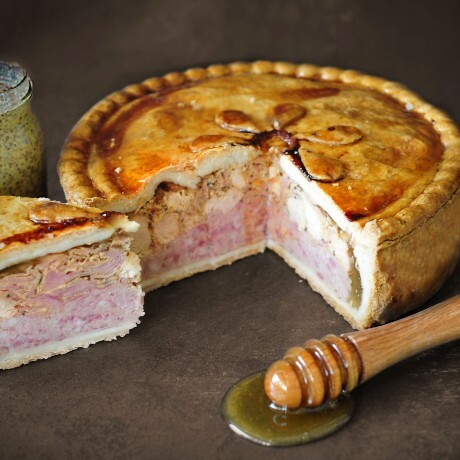 This 3 star Gold Award Winning Yorkshire Farmer's Pork Pie is a firm favourite. A delicious combination of prime British Red Tractor pork pie meat, succulent chicken breast and Wiltshire ham all marinated in wholegrain honey mustard. This gives a beautiful mustard sharp yet sweet tangy flavour. Lovingly handcrafted using only the best locally sourced ingredients. Available as a Medium (1.1kg) or Large (2.2kg) cutting pie. The filling changes slightly depending on size, please see the images provided. 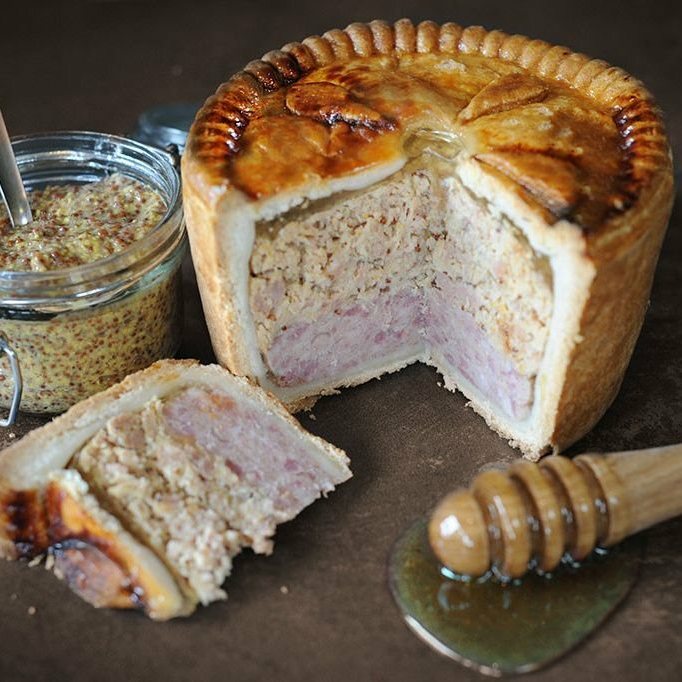 This pork pie makes an excellent centrepiece for any event! Goes perfectly with a crisp Golden Ale or Blond Beer. Shelf Life: 7 days from day of delivery, keep refrigerated. Delivered vacuum sealed - if kept sealed product shelf life is 10 days. Suitable for freezing, freeze on day of delivery. Delivery Information: After you place your order Topping's Pies will contact you to arrange an exact day of delivery. They have a minimum lead time of 3-4 days. Your order will be delivered by 4pm on your chosen day, usually before 12 noon. If any of the details you have given in your delivery address are incorrect, Topping's Pies are not liable for any items which are not received. Be sure that there is someone is at the address when your order is delivered as it will need to be signed for. Please provide a contact telephone number (preferably a mobile) at checkout which will be used by the delivery company. Fortified WHEAT Flour [WHEAT Flour, Calcium Carbonate, Iron, Niacin(B3), Thiamin(B1)], Pork (21%), Water, Wiltshire Cured Ham(10%)[Pork, Salt, Preservative (Potassium Nitrate, Sodium Nitrite)], Chicken(10%)[Salt, Dextrose, Brown Sugar], Lard, Honey & MUSTARD Dressing (9.0%)[MUSTARD & MUSTARD Seeds, Sugar, Red & White Wine Vinegar, Vegetable Oil, Sherry Vinegar, Water, Garlic, Salt, White pepper, Tabasco Sauce(Distilled Vinegar, Red Pepper, Salt)], Seasoning[Fortified WHEAT Flour(WHEAT Flour, Calcium Carbonate, Iron, Niacin(B3), Thiamin(B1)), Salt, Spices, Potato Starch, Preservatives(Sodium Nitrite, Sodium Nitrate)], Pork Fat, Jelly [Pork Gelatine, Dextrose, Salt, Stabiliser (Carrageenan), Gelling Agent (Potassium Chloride), Yeast Extract, Natural Flavouring)], Salt, Glaze[Maltodextrin Potato, Dextrose, Cornflour, Stabiliser (Carboxymethyl Cellulose), Colour (Beta- Carotene), BARLEY Malt Extract). These pies are amazing. Vast choice, all delicious, and they freeze really well. Communication is excellent - you know exactly when they are coming and they arrive really well-packed in an insulated chill box. Will keep coming back for more. Being a big pork pie fan, I ordered the Scrumpy one for my manager for Christmas & to say he was pleased was a bit of an understatement! I was kept informed of when to expect it, from ordering to arrival and when arrived it was well wrapped & in its own mini refrigerated insulation box. I have a family event coming up (all pork pie lovers) so will definitely be ordering from here again, if not for that then definitely for my managers subsequent birthdays & Christmases. Best pies I ever had the pleasure of eating! Premium quality British pies, crafted by hand with passion.